Counterclockwise: Rudy Roughnight, Ashley Winchester, Dean Stark, Virginia Maxwell, and Jude Maverick. A cult RPG series by Media Vision and published by XSEED Games, Wild ARMs combines classic RPG gameplay with a Wild West/Steam Punk setting and influence. Take the best parts of Final Fantasy and The Legend of Zelda and toss in some The Good, the Bad and the Ugly for good measure and you've got most installments of Wild ARMs. The series currently has seven installments. The ARM in the title refers to the guns used by various characters. The reason it is capitalized is because it is an acronym that means something different in each game. Wild ARMs/Wild ARMs: Alter Code F for the PlayStation and PlayStation 2, respectively. Wild ARMs 2nd Ignition/Wild ARMs 2 for PlayStation. Wild ARMs Advanced 3rd/Wild ARMs 3 for PlayStation 2. Wild ARMs: The 4th Detonator/Wild ARMs 4 for PlayStation 2. Wild ARMs: The Vth Vanguard/Wild ARMs 5 for PlayStation 2. Wild ARMs XF / Wild ARMs: Crossfire for PlayStation Portable. The games often deal with themes of self-discovery and growing up. Other important themes involve rebuilding the world, since each game takes place on the barren wasteland known as Filgaia. While a traditional RPG in the sense of battling, Wild ARMS also introduces tool-based exploration and puzzle-solving, giving it some minor action RPG elements. Combined with this, later iterations of the series also gave each character a special ability that complements their roles: Mage characters can use Extend to cast his magic on every enemy while the Jack-of-All-Stats characters can use Accelerator to go first, for example. 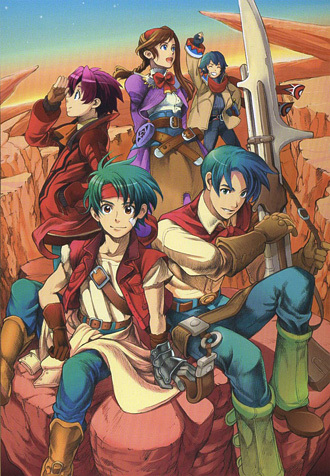 In addition to the game series, there has been a manga adaptation for each installment, as well as an original manga known as Wild ARMs: Hananushubito / Wild ARMs: Flower Thieves. The series has also had its own anime, which is called Wild ARMs: Twilight Venom. While the franchise hasn't enjoyed the massive success of Square-Enix's RPGs, it has managed to build up a loyal fanbase, especially in Japan where the first five games have all managed to become part of the "PlayStation The Best", which is similar to the Greatest Hits and Platinum Range labels. Has an Anime Spiritual Successor in the form of Senki Zesshou Symphogear, which shares a lot of the same writing and directorial staff. Ability Required to Proceed: The various tools that you get throughout your adventure are used to solve various puzzles. In particular, expect to use said ability a great deal in the dungeon in which you find the item. After the End: Planet Hiades that the Metal Demons come from is implied to be Earth...after the humans all became robots. And Now for Someone Completely Different: The way the first three games opened. The Battle Didn't Count: A natural result of Recurring Bosses. Bittersweet Ending: Most of the games end with the heroes saving the day, but Filgaia worse off than it was before. It's more bitter than sweet in 5 and XF, especially. Black Market: They sell healing items!! Bonus Boss: Ragu O Ragla in every game, and bunches of others that vary from game to game. Bonus Dungeon: The Abyss in many of the games, and a few others. Bragging Rights Reward: The Sheriff Star, for the most part. It's almost always given as a reward for beating the hardest Bonus Boss, but of course, by that point, you don't need the tremendous stat boosts it gives you. Recent games have begun to allow you to carry over accumulated Sheriff Stars via New Game+, making this a little more feasible. 4, 5 and XF subverted this by allowing you to make your own Sheriff Stars. Instead, this turned the most powerful item in the game into something you almost desperately need in order to defeat Ragu O Ragla. That said, sometimes the reward was another Sheriff Star. Braids, Beads and Buckskins: The Baskars in most incarnations, especially in 3. Canis Major: Luceid, the Guardian of Desire, takes the form of a wolf (or wolf-like dog). Chest Monster: The mimics and the Black Box boss, which can only be fought if you open every single chest in the game. Combination Attack: In all the games from 4 on. Desert Punk: especially Wild ARMs 2 and 3. Dual Wielding: Virginia in Wild ARMs 3 dual-wields pistols; Dean in Wild ARMs 5 dual-wields guns with tonfa-like ammo clips. Duel Boss: Usually several per game, not counting prologue bosses. Empathic Weapon: The titular ARMs, usually. Enemy Scan: The Analyze spell. Evolving Credits: The opening animation generally changes based on how far into the game you've gotten. Fake Difficulty: Wild ARMs 2, 3, and Alter Code F don't allow you to buy healing items in shops. This is justified in that healing items are fruits or berries, and you're living in a wasteland. There are sidequest that allows you to grow your own fruits and berries, but they do not usually come in until about halfway through the game. Fantasy Counterpart Culture The setting is generally Desert Punk, but there are random terms and cultural elements from many different sources scattered throughout. The Baskars are a mix of Native American and a hippie-ish religious commune. Four Is Death: Cocytus in Wild ARMs 2 is comprised of four members. There is also the Quarter Knights from the original game and the Sentinels from Wild ARMs 5. The Four Gods: The guardians Grudiev (the Azure Dragon), Moor Gault (the Vermillion Phoenix), Fengalon (the White Tiger), and Schturdark (the Black Turtle). Fun with Acronyms: The eponymous ARM stands for something different every game. There's also the EMMA Motor, which appears in the first two games, but Marivel from 2 claims that the name is an acronym, and that it definitely is NOT named after its inventor. In reality, she's got it backwards (it's still a nice Continuity Nod though). Guide Dang It! : Finding all the Puzzle Boxes, let alone solving some of the later ones. Finding all of the EX File Keys. Forget that: Finding all of the treasure chests! The Gunslinger: Almost everyone who wields an ARM. Hello, [Insert Name Here]: Taking this one step further, practically every spell in some of the games can be renamed and in some games nearly every NPC can be renamed. Heroes Prefer Swords: Averted in all of the games except for the original (although not the remake of the original). The main characters use the titular ARMs. Improbable Weapon User: Caina's main weapon is Randolf the magic key. Lilka uses an umbrella. Arnaud has quill-pen-shaped throwing knives, Dean's main attack utilizes the aforementioned tonfa-like ammo clips, and Chuck has a "pilebunker" (a tool that works kind of like a jackhammer). Inconsistent Dub: The game's were translated by different companies, with varying levels of quality. Ley Line: The Ley Line is referenced in 1 and 3. Ley points also appear in 4, 5, and XF. Limit Break: The Force Point system. How it works is slightly different in each game, but in every game there are special moves you can perform by spending 25, 50, 75, or 100 Force Points. In some games, you must build your Force Points up before you can access some of your other spells and abilities. Typical moves are Extension and Mystic(which expand the range of Magic and Items respectively), Accelerator, which makes you go first in the round, and Aim, which makes your attack hit without fail. Summons also use Force Points. Limited Sound Effects: exactly one block-pushing sound, multiple floor surfaces the blocks are on. Lost Technology: The Holmcross, the Golems, the Dragons, the Metal Demons, ARMS, etc. etc. Lost Colony: The human population of Filgaia are revealed to be colonists from Earth in the third game, and this is also referenced in the fifth. The planet's tumultuous history has meant this is largely forgotten. Magitek, Magic from Technology, Magic Versus Science, Doing In the Wizard: Depends on which game, pretty much every combination possible throughout. Metal Slime: Grow Apples, Mega Apples, Melchoms, and Creeping Chaoses. Mordor: Filgaea has been this at various points in its history, usually set after the disaster that made it that way. Musical Nod: "Into the Wilderness" from the first game has been remixed and used in most of the rest. Nanomachines: seen frequently in the series, especially in 3 and 4. New Game+: The EX Keys unlock bonus content after you have completed the game including this. Nigh Invulnerable: One of Recurring Boss Trask's central traits is his absurdly high defense. Non-Linear Sequel: Think of a Multiverse, each having their Filgaia of their own. Each have their own "Mothers" and such. Numbered Sequels: All of the sequels except XF are numbered in their North American releases. Their names contain those numbers in the Japanese releases, but are named much more colorfully. Our Elves Are Better: The Elw, native inhabitants of Filgaia, are immortal (versus natural causes), highly spiritual, and far better than humans in terms of Functional Magic and Magitek. They have the "thin and pretty" part of the traditional elf image, but their ears are vaguely rabbit-ish rather than simply pointy. Our Dragons Are Different: They're biomechanical extradimensional creatures who can turn into airships. Their bones are also made into weapons, such as the titular ARMs. Our Demons Are Different: The Metal Demons of the first and third games are humans turned into living metal by alchemical Nanotech. The demons of the second game (and one in the third) are some mix of Anthropomorphic Personification and Eldritch Abomination. Our Vampires Are Different: Crimson Nobles are powerful long-lived blood-drinkers who take damage from direct sunlight, but they are born normally, not by being bitten, and are not really "undead". Pimped-Out Dress: Quite a few character designs, like Virginia and Alexia. Puzzle Boss: Sort of. Many bosses can be made much easier by using specific trick methods, including Vinsfield's ghost: a Bonus Boss in the second game who can repeatedly take off most of your party's health on each of his turns, but can be killed instantly, before he acts, with absolute certainty, by casting one spell. Recurring Boss: Trask/Tarasque, a Nigh Invulnerable turtle...thing that debuted in Wild Arms 2 and has appeared in most games since. Also, see Bonus Boss. Recurring Character: Similar to Final Fantasy's Cid, each game has a character named 'Tony', who has a different role each time. Recurring Element: Take place on a world called Filgaia, with money called gella, usually star a blue-haired hero, and have a victory music track called "Condition Green!". The party frequently includes a Cyborg or Artificial Human. Additionally, the Guardians, the Baskar and an often sentient robot/golem named Asgard. Each game's soundtrack includes a song titled From Anxiety to Impatience. The songs are different, but this particular title is always used. Sand Is Water: Especially in 3, but present in 1 and 4 as well. Saving the World: It's an RPG. Scavenger World: Varies with each game, but technology is usually in a decline. Shout-Out: Siegfried might as well have been called Nightmare in Wild Arms 3. There are also many recurring names and events throughout the series, and every single playable character is seen as an NPC in 5. Sliding Scale of Idealism vs. Cynicism: Ultimately fairly idealistic, though some games (particularly 2 and 3) tend towards cynicism a bit more then the others. Space Amish: The Baskars are a religious community who live a simple life "in harmony with nature", despite having a better-than-average knowledge of the setting's Magitek. Elw have a bit of this too. Sprite/Polygon Mix: In the first two games. Summon Magic: The Guardians in the games before 5. Super Title 64 Advance: Averted so far, as all games in the series have appeared on MIPS-powered consoles, not the ARM-powered PlayStation Vita. Swiss Army Weapon: Wild ARMs 4 has the main character's gun turn into a sword when out of ammo. Wild ARMs 5's lead has, again, guns with tonfas for ammo clips. Temple of Doom: A staple of the series, packed with traps and puzzles that can be conveniently bypassed and solved with the tools the party has picked up along the way. Theme Naming: Several main characters are often named after types of guns. Time Stands Still: Summoning Dan Dariam. Walking the Earth: Those who call themselves Drifters. Can be anything from heroes to outlaws to neutral mercenaries. The World Is Always Doomed: Filgaia may be the most unlucky planet in the history of fiction. At least planets that blow up stop having problems. The Very Definitely Final Dungeon: The series has a tendency for this.